Use Flower Servant and it will remind you when to water, mist, fertilize or repot Codiaeum variegatum Gold Star. Click here and try for free! Codiaeum variegatum or Croton is a hard to grow house plant with brightly colored leaves. 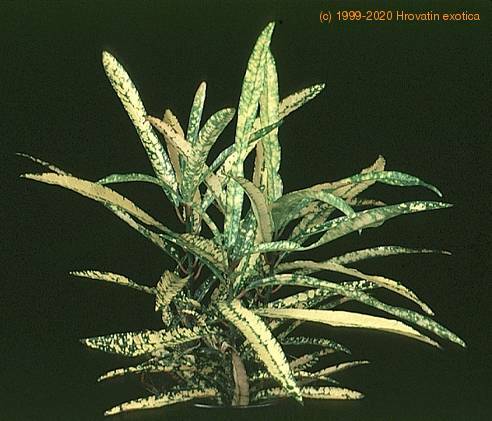 Best foliage color develops in high light to semi-sun. Allow the soil surface to dry slightly between waterings. Any house plant fertilizer may be used according to label directions during the growing season. Croton requires a minimum temperature of 60°F (15°C) with ideal temperatures 80°F (27°C). Repot in March and expect lower leaves to drop as the plant ages. Croton responds to extra humidity but leaf drop occurs in low humidity or temperatures below 50°F (10°C). Propagation is by air layering or stem tip cuttings. Cuttings are taken in spring or summer and rooted at temperatures between 70°F and 80°F (21-27°C).